You will probably like this game if you like zIQ or Iceblox. 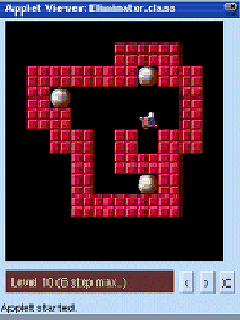 Eliminator is a simple Java game where the aim of the game is to remove all ball objects from the labyrinth type game board. This is made harder as only a limited amount of moves is allowed and each move moves all pieces as far as they can freely move. Pieces of the same colour vanish from the board if they touch each other. A level is won once all balls are removed. It is lost if this goal cannot be achieved anymore, for example if only one piece of one particular color is left. The game is a typically logic puzzle game where you have to order pieces on a game board. As its difficulty is moderate and the rules are easy to grasp the game is fun. However, the graphics are simple and there are features like highscores missing. Also many levels can be solved by more or less randomly choosing a direction. With only a few allowed moves there are not so many principle key combinations possible. The game is nice if you like these type of logic puzzles but it probably won't catch you too long.